Do you prefer wall hung or freestanding vanities? We much prefer wall hung to free standing as they create the illusion of extra space. They are also much more for practical when it comes to cleaning! Do you recommend drawers or doors to your clients? Drawers are much more user friendly as you don’t lose your things up the back of the cabinet! The only down side to drawers is you need to lay larger items on their side which takes up more space in the cabinet, but you can solve the issue by adding a shaving cabinet! What type of basin would you recommend? Semi recessed or top mount basins are best to maximise storage in your vanity cabinet. Under-mounts are great for extra bench space (and cleaning) but you do lose drawer or cupboards space to achieve this. 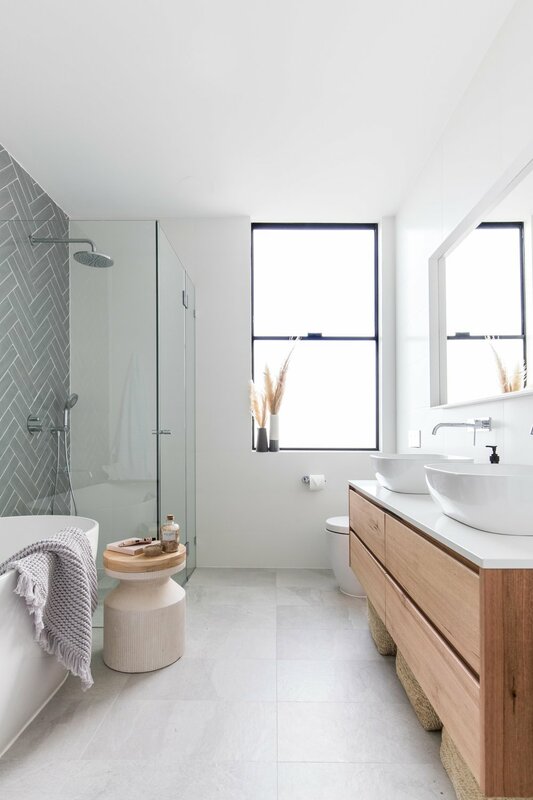 Do you recommend timber or stone bench tops in bathrooms? 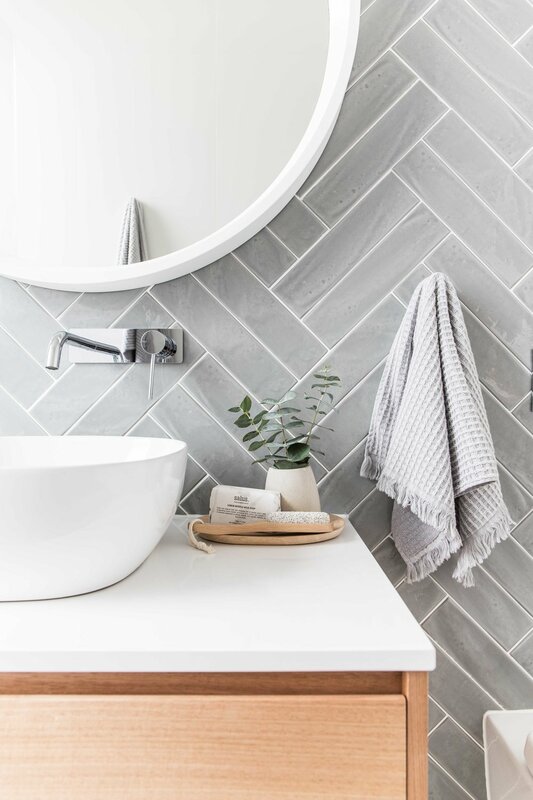 Stone is the best choice for a busy bathroom! Stone is definitely the most practical choice of material for wet areas. They are care free and easy cleaning but you can't go past the look of timber to add warmth in a bathroom! When making the decision for your own renovation, you need to ask yourself ‘will everyone clean up after themselves? If not, stone is the way to go! The finish we use on our timbers at Loughlin Furniture is very durable but nevertheless, if excess water is continuously not cleaned up after use, the water will find its way in over-time damaging the product. What do you recommend as a standard vanity height? Rule of thumb with vanities is the same as a kitchen…900 - 950 is the standard. This measurement is from the top of your basin to the floor. As all vanity and basin combinations are different the vanity itself does not have to stick to a 'normal' standard height. What is your most popular vanity? Our most popular vanity is ironically the first vanity we have ever designed (about 4 years ago now)- The Avoca! Although it has had some slight design changes over that time, The Avoca is just a simple, beautiful and practical design. 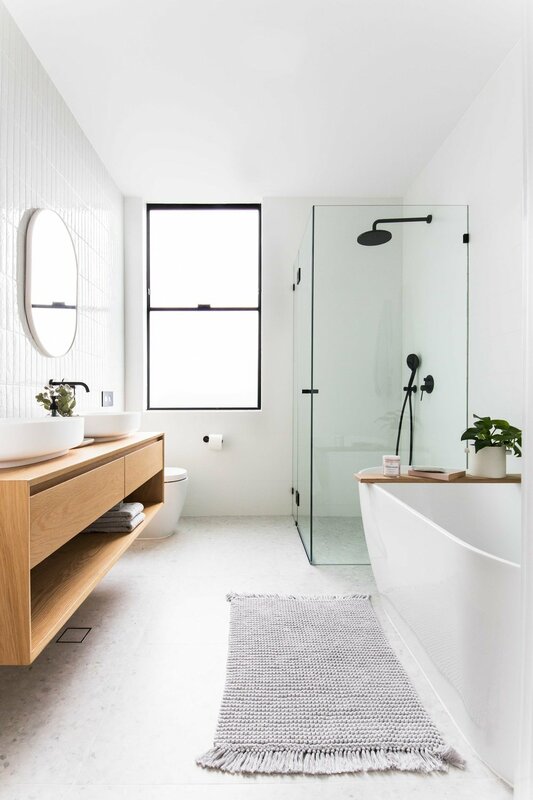 It really does suit every bathroom and was designed to be the 'hero' or 'stand-out piece' of the room - meaning, all the timber you need in that one piece to achieve a certain look. What do you tell clients about having timber in wet areas? The only TLC our vanities require is wiping away the excess water (on timber top vanities) and ensuring your only cleaning the surfaces. Creating a Concept, The Stables way!